Those who have been patiently waiting for the release of the iPad 2 and iPhone 4S untethered iOS 5.x jailbreak can breathe a tiny sigh of relief this evening, knowing that the time scales are shortening, and a public release approaching. We still haven’t had the green light from any of the developers involved that the jailbreak is ready for prime time, but with every blog and Twitter update; the signs are all pointing to the fact they Pod2g and his Dream Team of developers are winning their battle against the A5 devices. Judging by the amount of retweets and replies that each update receives, whether it be from Pod2g or PlanetBeing, the community is waiting with baited breath in anticipation of A5 liberation. With the whole process beginning in November last year, the people involved have been periodically drip-feeding information to the community whenever a goal has been reached, or a potential show stopping problem has occurred. I think the development journey has been one of the most transparent in jailbreak history, with Pod2g doing a magnificent job of keeping his fans in the loop about progress. Recent updates from the French iOS security researcher have included a video which shows the iPhone 4S running iOS 5.0.1 with an untethered jailbreak. The video was taken and supplied by famous developer, and Chronic Dev Team member, Dustin Howett, who is responsible for various utilities including a cross-platform set of development tools designed for managing, developing and deploying iOS software which negates the need for Xcode. This evening has brought what is perhaps the shortest blog post in Pod2g’s history, consisting of one uploaded image and four words. 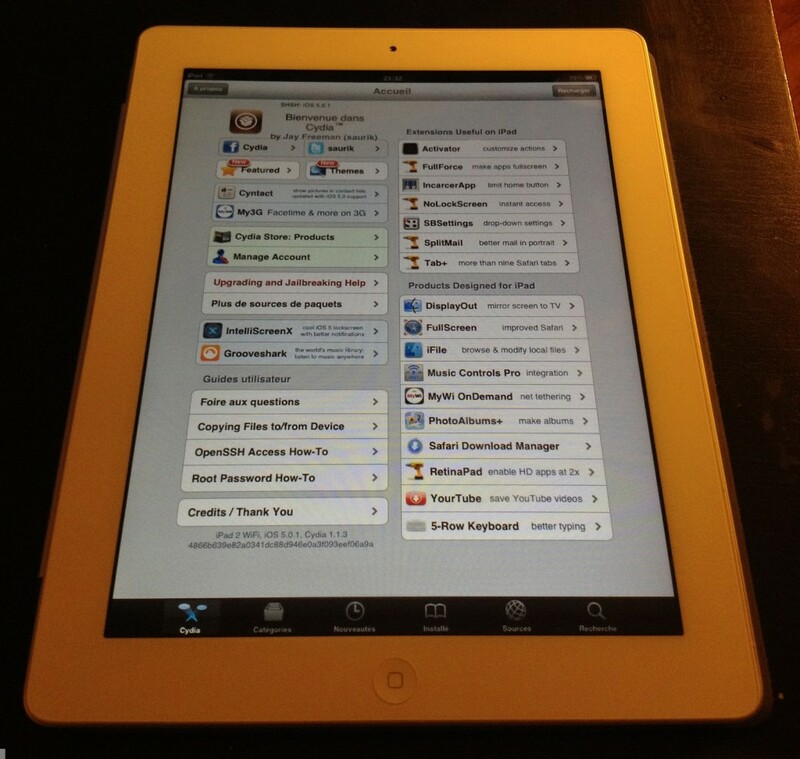 Although lacking in content, the latest post is perhaps one of the most informative on his blog, featuring a picture of an iPad 2 with Cydia 1.1.3 running full screen and clearly showing that it is running on iOS 5.0.1. The post is adorned with the words ‘No more to say!’, clearly showing that the net is closing in and a release of this jailbreak could be imminent. As I am writing this, I can see my iPad 2 sitting next to me looking lonely and unloved. Hopefully it won’t be long until I can install Cydia onto it and give it the freedom it so thoroughly deserves. And those of you who are sporting A4 devices, you can follow our complete step by step guide posted here to jailbreak iOS 5.0.1 untethered on iPhone 4, 3GS, iPad 1, and iPod touch 3G/4G using Redsn0w or Sn0wbreeze.